Brunette hairstyle with stylized waves and heavy bangs. 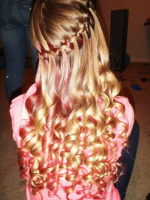 Long and wavy hair that is brown with highlights and long layers. Short and wavy white blonde hairstyle.